There are two common ways that Malaysians eat stingrays. One, in an asam pedas spicy gravy and two, grilled on a banana leaf. The former is favoured by home-cooks because it's convenient and is a perfect accompaniment for their rice meal. The latter is widely sold in hawker stalls, a street food that is usually enjoyed on its own. Asam means sour in Malay, pedas on the other hand means spicy. Wikipedia describes asam pedas as a sour and spicy stew that is popular in Indonesia and Malaysia. 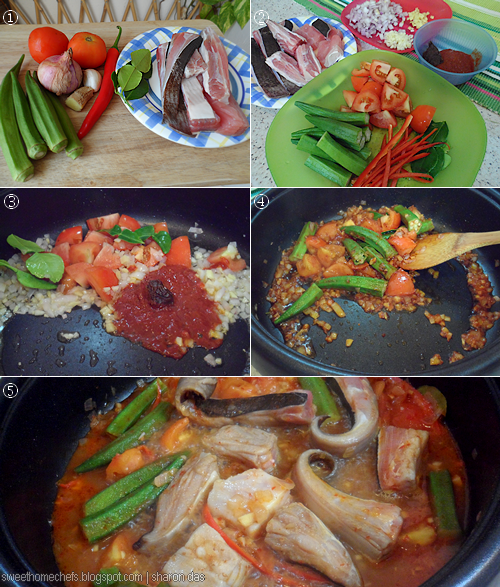 "The main ingredients in asam pedas are usually seafood or freshwater fish. They are cooked in asam (tamarind) fruit juice with chilli and different spices." 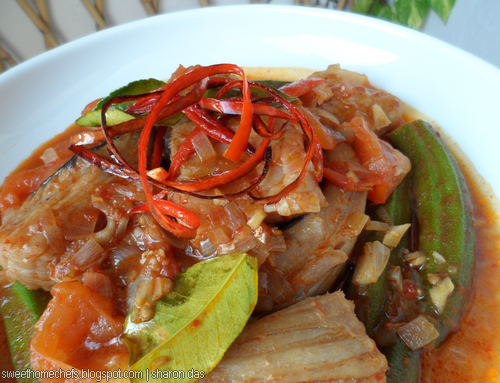 Asam Pedas fish is typically cooked with bunga kantan (torch ginger) and daun kesum. In the absence of these ingredients, kaffir lime leaves is another great way to go about it. Those who enjoy an extra kick will add toasted coconut, black pepper and/or additional spices such as turmeric, cumin, fenugreek or aniseeds. The variations are too many to mention. How I cook asam pedas is always a simple affair mainly because I don't have a lot of time to spend in the kitchen on work days, nor do I wish to fork out too much on a regular meal. 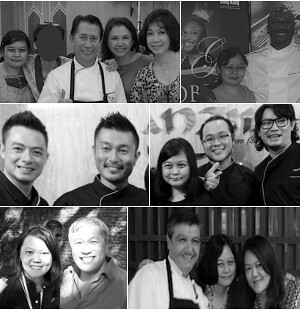 Special occasions are a different story, of course! 1) Heat some cooking oil in pan. 2) Saute onion, garlic and ginger for a bit. 3) Add tomatoes, kaffir lime leaves, chilli paste and tamarind paste. Stir to combine and fry it for a bit. 4) Then, add the ladies fingers in. Stir to coat. 5) Add about 1½ cups water. Simmer until the ladies fingers are cooked. Then, season with sugar and salt. 6) Add the fish and slices of red chilli. It's done when the fish is cooked. Optional : Garnish with grilled slices of chilli. Best eaten with white rice. 1) Gathering the ingredients. 2) Chopped and ready to be cooked! 3) Add the paste after sauteing the onions and garlic. 4) Add the vegetables. 5) Finally, add in the stingray! Not sure I have ever had stingray before..it looks very appetizing with all the spices and veggies, Sharon. This dish sure looks delicious Sharon...packed with flavors...I would love to try it! Hi Sharon, both ways of stingray simply appeal to me. 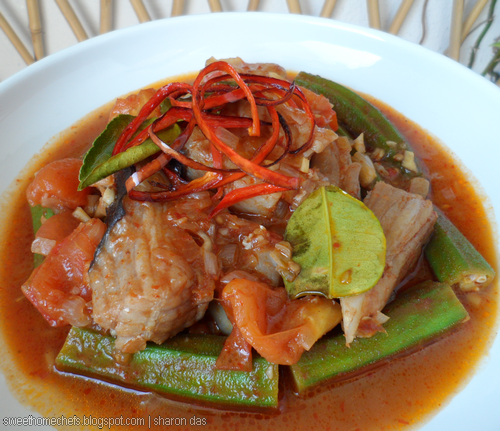 This asam pedas stingray looks amazing! I would love to eat all the lady fingers, my favourite vegetable in asam!